Great News Gateshead was broadcast free of charge on Universalsports.com - the heir apparent to WCSN.com - on Sunday morning. If you missed the meet, watch the replay here. Subscriptions no longer needed. "I was injured three weeks before the Games. I had problems with my Achilles tendon so this makes up for that. Now I�m looking forward to the rest of the season. I intend to go out there and show everyone I can still run fast over 1,500m." - American Bernard Lagat after winning the 1k in Gateshead in a personal best and defeating bronze medallist Nick Willis in the process. Willis was the man who kept Lagat out of the Olympic final. "It would have been different in the Olympics if I had run like this. But the past is the past and this is the present." - Former world record holder Asafa Powell, commenting after running a sensational 9.87 in the pouring rain in Gateshead. 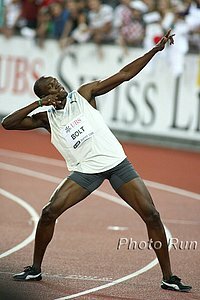 In the Olymipcs, he ran a 9.95. James Carney led wire to wire although he was challenged for the first half. On the women's side, Elva Dryer had the early lead but it was a 3 way battle down the stretch with 19 year old Ilsa Paulson and former Georgia Star Jill Steffens. Steffens prevailed for the biggest win of her career. Saturday she's getting married. More later.